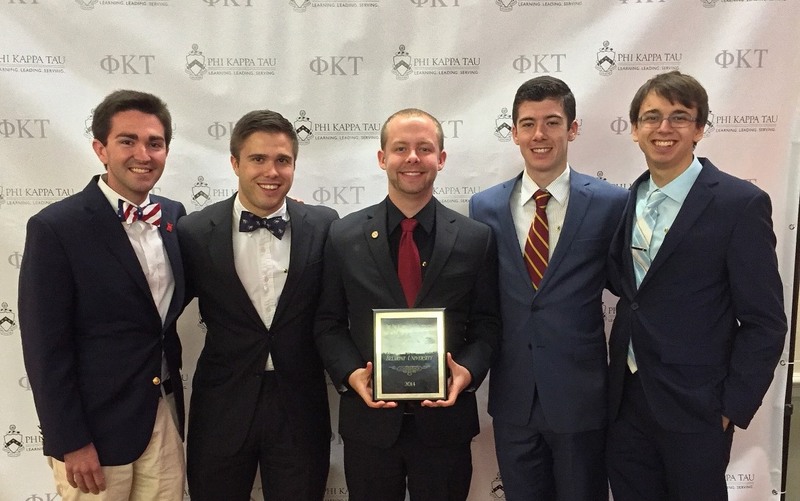 On Saturday, July 18 Belmont’s Phi Kappa Tau chapter was recognized as a Founder’s Finalist, one of the national organization’s top four chapters, at the Phi Tau national conference in Oxford, Ohio. The Zeta Alpha chapter was given the opportunity to make a presentation for the Maxwell Award, the title given to the nation’s highest performing chapter. Belmont senior Joey Whalen and juniors Kirk Bado, Hayden Rutledge and Drew Kovacs participated in the presentation and emphasized Belmont’s unique Greek environment and the chapter’s AskPhiTau service, a service-oriented program that receives request from the community via social media. The team discussed the culture among fraternal life and Belmont and the ways they’ve been successful. “The thing that makes Belmont’s Greek system unique is that each organization truly cares about the campus life as a whole and works to improve the experience not only for themselves, but also for every student organization,” Rutledge said. While the Nebraska-Wesleyan chapter went on to win the award, the team said they were honored to be selected as a finalist and share their chapter’s programs with schools all over the country.